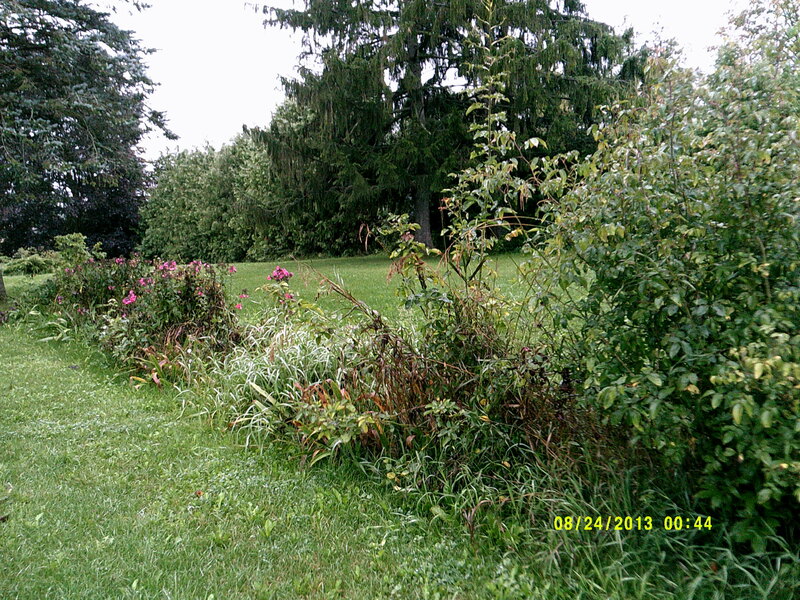 Sherry is back today with her second post on The Gardening Project. You can read the first post HERE. Hello again one and all, so glad you came by. This week I’m feeling a little like a one-armed paper hanger at the top of a ladder with an itch on the back of my ankle… almost too much to do, and hardly know where to start…good thing I have a planner – this is the type of week it’s needed most. Too bad my former way of spontaneous planning (going by the seat of my pants) seems to kick in during these weeks! Planning a garden redo is somewhat different than another project I’m working on (planning a weekend retreat with firm deadlines, etc. I sort of head up the ladies group that plans it; we’re just finalizing the details for this year’s retreat, which is this coming weekend. Did I mention I‘m reeeaaallllly busy this week?!) in that all of the work in a garden seems to be done around two things- time of year, and weather. 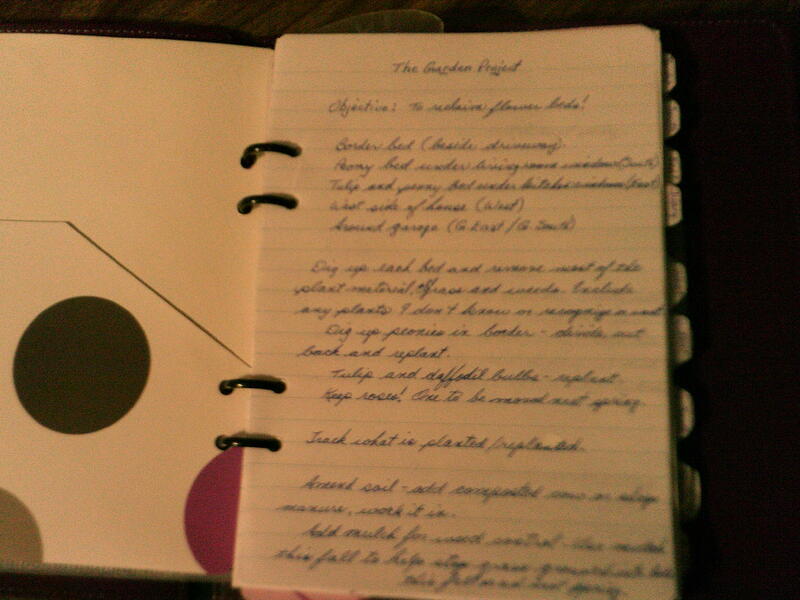 Writing in a block of time per day in a planner to garden doesn’t really work that well. I may plan ahead that on Tuesday I’ll (try to) dig up 5 feet of border between 2 and 4 pm, but if it rains an inch and a half Monday night, there is no digging Tuesday, or Wednesday, or maybe even Thursday! At least, not in the border bed I choose to start this project in. And in my part of Canada, digging and planting does not happen in winter- anytime from about late October to early April and even into May; frozen ground and snow happens during most of those months! I chose two beds as my priority this fall: the border bed and the south bed. The border bed I chose first for three reasons- location, what plants are growing in it, what the plants are growing in, it’s size; and because it’s the most overgrown! Okay, so I can’t count, and the last two are almost the most important reasons. The south bed was chosen because of what is growing in it. 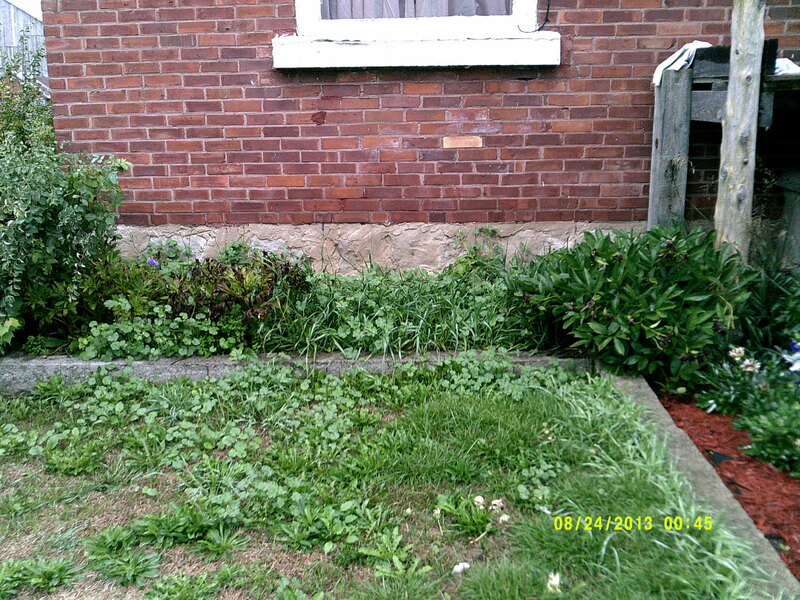 The border bed is a complete eyesore- it is a 44 foot long by about 4 ½ foot wide of mess right beside the driveway! So getting the border bed done first really kick starts my project and gives an almost immediate return on the work invested. I’m almost embarrassed to show any photos of this bed- about the only thing you can really make out is grass. Not just any grass, this is twitch grass. Twitch grass spreads by roots that can grow up to two feet or more deep and sideways by many more feet, then pop up anywhere. There are also dandelion plants (a yellow flower in early spring and summer) with tap roots that can grow deeper than 2 feet, and a vine I call bind weed, which grows up and twines tightly around other plants. These roots also grow very deep. The trouble with these plants? If you don’t get ALL of the root out of the ground, if you leave just a small bit, especially of the bind weed and twitch grass- it comes back, again, and again, and again. It takes a lot of digging to get these roots out sometimes, and it’s not a job I do without wearing my glasses. I remember when we moved here the soil in this bed would dry out in the heat of summer, and form cracks; this is typical of heavy clay based soil. It also took a long time to dry out in the spring and didn’t drain well. After a few years of struggling with the soil I began adding compost and peat moss (the last added more than five years ago). I must say, when I began digging a couple of weeks ago, it was a bit easier than I thought it would be because of those amendments. More is needed and I will be buying some this fall. Yes, I, a farmer’s wife (we have beef cows/calves) will indeed be purchasing composted cow or sheep manure to add to my flower beds! Everything our animals produce ends up on the farm fields as fertilizer. Besides, the manure needs to be composted and what we have is rarely left long enough to break down into a useable form for flower beds; fresh manure will be too hot and burn plants. Not to mention the smell! Peat moss added with the compost does two things in heavy soil: helps aerate, making it lighter for plant roots to grow easily in; and it helps hold water, releasing it slower. 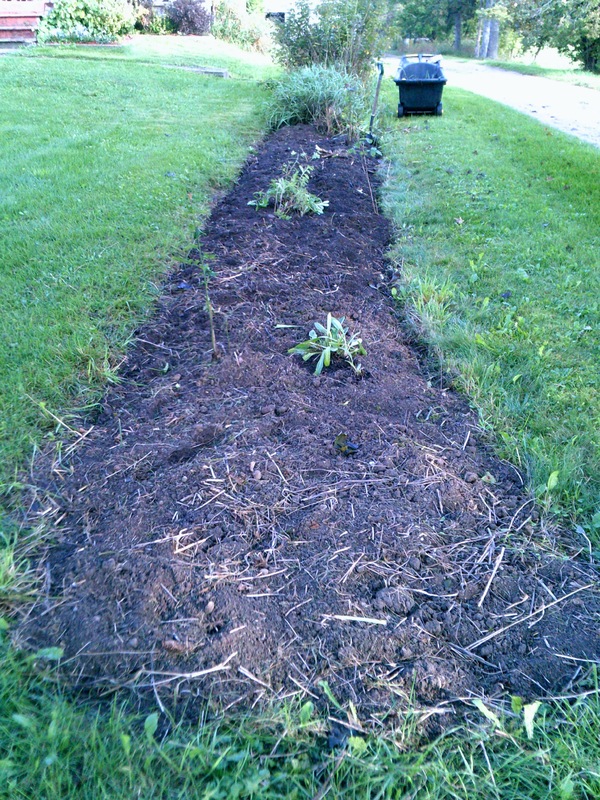 I will also add mulch on top of the bed this fall, to help with weed control. Spring blooming flowers is another reason for getting as much digging done this fall as I can- peonies and daffodils are two spring bloomers, and there is another shrub I don’t remember the name of in my garden. Peonies are a long lived bushy type plant that blooms in late May and early June. Because they are a spring bloomer, the best time of year to dig up and divide them is in September, as they need the summer to prepare for next year’s bloom. Daffodils bloom about the same time, putting out roots in the fall, and also need to be planted in September. Last week I dug up some daffs and there were roots shooting out- my job tomorrow is to replant them. The border bed has three large clumps of peonies, a beautiful dark rose colour. I will be saving all I can and replanting them, most back into this border. These peonies have been in this bed more than 25 years, a lovely foundation plant that add interest to my garden all season, and will be there for many more years I hope. 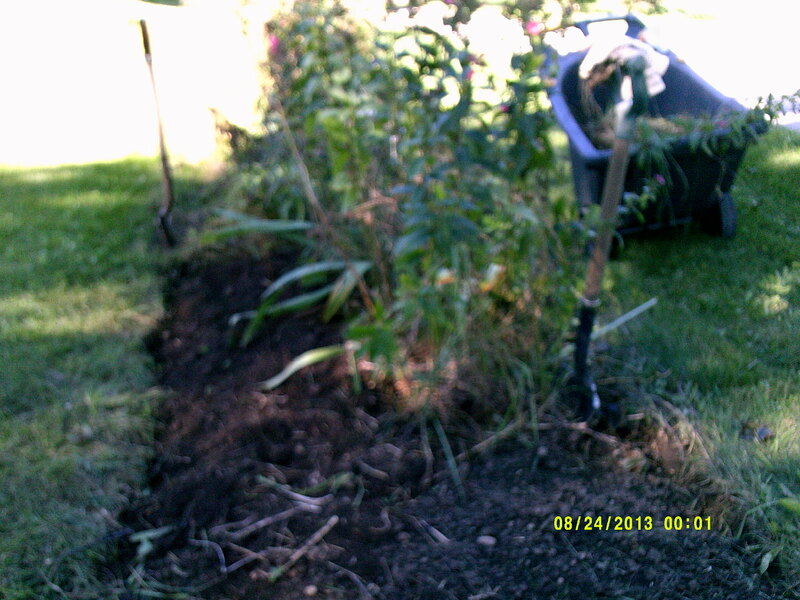 The size of this bed (44’ by 4 ½ ‘) was another reason to get it done first- that’s a lot of digging, with only a shovel. The second bed, the south bed, which is below the living room window, has all peonies growing in it, and in the 23 years we’ve lived here it has only ever been weeded, no amendments added. This year one of the peonies did not survive, so I will be replacing it from plants I divide. There won’t be time this week to get to this bed, but peonies can’t really tell time, so they don’t know it’s October when I get to it. I set aside time in afternoon or evening to get in a couple of hours of digging every other day or so, though I nearly did myself in the first day going at it for two hours. I really wondered if I could get this project done. But, as most things in life I tackle, it’s 10% planning, 90% determination to get it done! The border bed is not quite done yet- we actually did get one and a half inches of rain last Friday evening, and did I mention the retreat I’m helping plan that’s this coming weekend? 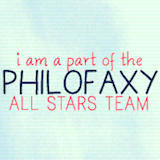 I am making progress…not quite so busy now… this post is out of the way…itch is gone?…maybe…yes!